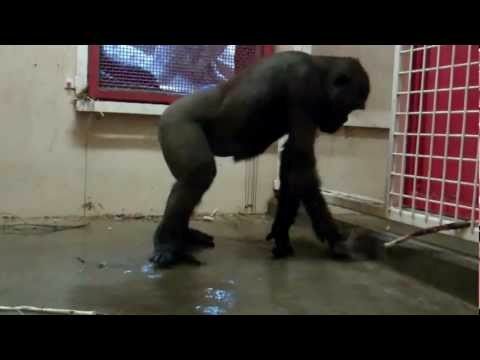 Zola, the nine-year-old gorilla living at the Calgary zoo, is puting b-boys to shame with his acrobatic dance moves. Zookeepers spotted the gorilla "breakdancing" late last week, and shared footage on YouTube of the gorilla stomping and spinning to his own beat. Zola is one of eight Western lowland gorillas in the Association of Zoos and Aquariums Gorilla Species Survival Plan. "He loves to play in water and keepers regularly give him the opportunity to do so as part of the enrichment activities they plan and vary on a daily basis," officials say. The gorillla sensation comes as a welcome relief to more infamous Canadian viral images of the Stanley Cup riots.